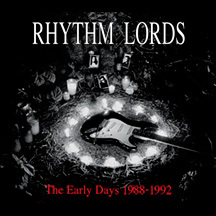 During the early days of the Rhythm Lords, the band recorded two EPs. The first one titled, “Rhythm Lords” which contained three songs. The second EP recorded a year later was titled “Evil” and delivered six songs. Both EPs were issued on cassette only. Neither of these two EPs were ever released in digital format until now. Plus as a bonus – there are three songs here that were recorded during the sessions for “Evil” but were never finished or released until now. The power of Richard Dover’s drums is a clear indication of what the Rhythm Lords were all about during those days. Loud and Proud – the Rhythm Lords carved out an audience from the depths of the LA Art scene calling Al’s Bar in downtown Los Angeles their home base for a short time. With Steph Traino locking in step with Dover’s drums, the band creates a sound that borrows from the blues, surf and instrumental music, rockabilly and filtered through the influences of The Fabulous Thunderbirds, Los Lobos, The Blasters, The Doors, The Cruzados, Led Zeppelin and ZZ Top. And as if this wasn’t enough, this CD release marks the first of a two-part celebration. As you are reading this, Root 66, Steph Traino and Dale Peterson are in production of a documentary of the Rhythm Lords during those early days between 1988 when the band was formed to 1992 when Richard Dover left the band.